I have never seen any of The Lord of the Rings movies. I have never seen any of The Hobbit movies. I have never read any of the books either. I don’t like science fiction or fantasy. I just might be the last person you'd expect to sign up for a tour to the Hobbiton movie set in New Zealand. So why would someone who's never seen any of the movies love Hobbiton? It's simple. Hobbiton is simply one of the coolest places in New Zealand! I visited the movie set through a special Azamara day and nighttime excursion during the Azamara Quest's overnight stop in Tauranga, New Zealand. The experience was the highlight of the cruise for me, without question. When I first saw the Azamara Shore Excursions tour list for the Tauranga overnight stop there were several great options. One choice was Rotorua, a thermal area of cultural importance to New Zealand's Māori people. It has cool geysers and mud pools. I visited Rotorua in 2003 and where I visited in 2003 and thought the sulphuric air smelled pretty bad, but it was an interesting place. I chose Hobbiton because I've seen pictures on social media and thought it looked really unique. 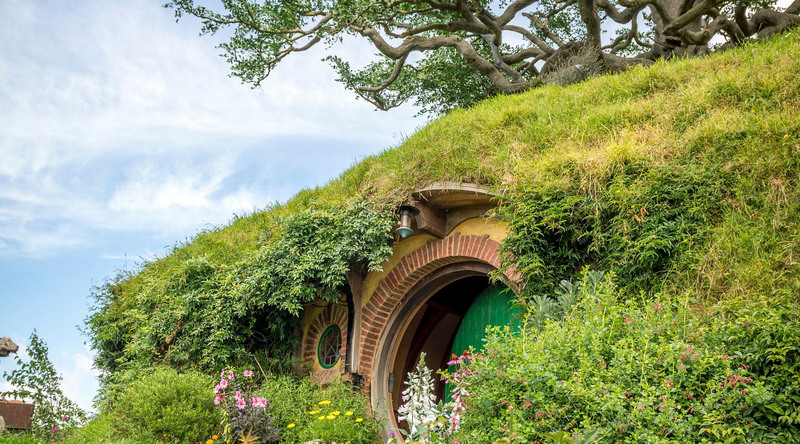 Located on a working farm about an hour or so from Tauranga, Hobbiton was originally set up as a massive movie set by The Lord of the Rings director, Peter Jackson, to be used for several movies. It was one of several sets they built around New Zealand, however, it’s the only one that still stands. It now gets about 2000 visitors a day! Hobbiton is immaculate. It is impeccably designed and kept extraordinarily clean with attention to detail that would make Walt Disney jealous. Even if you haven’t seen any of the movies or read any of the books like myself, you will appreciate the incredible design and attractive look of Hobbiton. The Lord of the Rings has left an indelible mark on pop culture so even if you haven't seen the movies or read the books, you're probably aware of how wildly successful they are. (Even I know the name Frodo!) Seeing this Hobbit village in its massive scale and perfect upkeep was impressive. The best part of by Hobbiton tour with Azamara was that it took place during the day and night - actually, it was more like twilight and night, which made it even cooler. First, I walked around the village of Hobbiton and took pictures of the Hobbit Holes, houses, and all the intricate details. The village is so colorful that you cannot help but smile. It feels like you've fallen down the rabbit hole or something. After the day tour, they set up a massive feast for the tour participants. It's a feast fit for a king! There is no way anyone finishes their food or the delicious local beers. You sit communally with the other people from your tour. We had about 50 people altogether. After the feast, they take you back through Hobbiton for a night tour. This is equally fun but very different than the first visit. There are even more intricate details, like fires burning inside Hobbit Holes and little candles lit in the windows. It makes it feel like there are actually Hobbits living there, and you can't help but appreciate it. The guides are excellent and relate everything to the books and movies if you know them well. But even for me, they made me feel like I was a part of the story. They also gave tons of good background information on the set now and during filming. Plus they led a singing and dancing party and who doesn’t love that? All in all, I loved this trip and I highly recommend it to anyone. Hobbiton is one of the coolest things in New Zealand and a must if you’re on the North Island. It was the highlight of the cruise for me! Azamara Club Cruises has four upcoming voyages calling on Tauranga, New Zealand. View them here.